The information on this page was compiled by Bob Rohrer based upon information gleaned from personal observation, from articles and observations by local historian Ray Crippen on these subjects and from books by AP Rose "History of Nobles County" 1908 and Al Goff "History of Nobles County" 1948, and from an 1882 State of Minnesota Geology report. 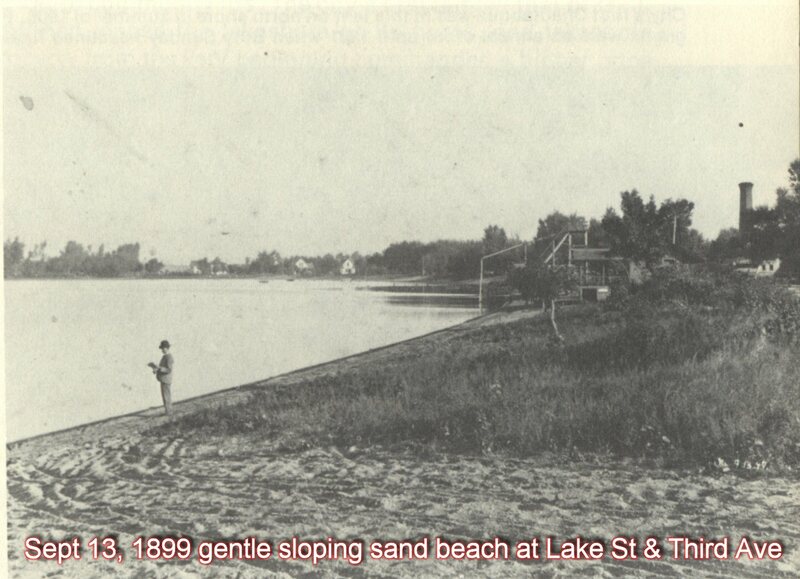 In 1900 the shoreline from about the base of Second Avenue to the junction with 7th Avenue along what we know now as Sailboard Beach changed. It changed forever with the laying of the Rock Island RR track. 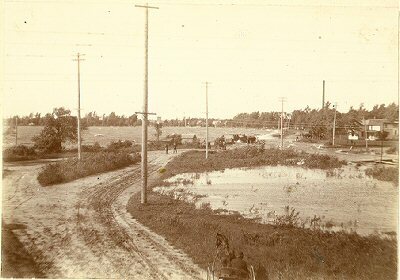 The RR built the base for their RR tracks between Lake Street and the shoreline. This required them to change the gentle sloping sand beach. They built up the shoreline height near the shoreline so that they had enough horizontal space between the street and the waterline to operate the trains. They also needed to fortify the track from lake waves and spring ice out. As of 1900 any Pavilions, boathouses, bathhouses, waterslides, or other structures that may have existed along the north shore of the lake were removed to make room for the construction of the Burlington Rock Island Railroad track along the shoreline. 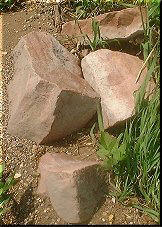 The Rock Island track remained there until into the late 1900's at which time it became a narrow, shoreline city park. Why were the Bathhouse & Waterslide Facilities located on the NE side of Lake Okabena? This was the most accessible shoreline one the lake. There was no early road around the lake. Most of the population lived within blocks of this beach. It was handy and prominent. 2. Chautauqua Park was the only other park. 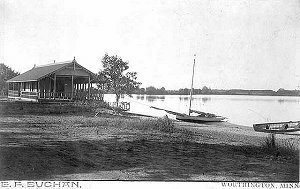 The Chautauqua Movement was just starting and brought people to Worthington and to Lake Okabena. 3. Prior to the Establishment of the "Beltline" in 1941 (est.) which routed traffic away from the center of town, area highways brought many travelers, farm families, and area shoppers through town and thus past the lakeshore where the Bathhouse & Waterslide facility existed and, thus, kept people aware of the nice facilities there. 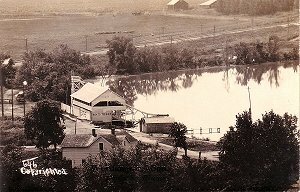 This provided a natural advertisement and promotion of the Bathhouse & Waterslide facilities on Lake Okabena. Those coming from the north on US Hwy 59, came down Humiston to turn east on 10th Street, then south on 2nd Avenue to the lakeshore where they went under the RR viaduct. In each case, people going places, farm families coming to town, and travelers would see this Bathhouse & Waterslide facility. This had a natural promotional effect for the bathhouse Association, and Worthington in general.. This, also, came in from the south under the viaduct with the same spectacular view of Lake Okabena and the Bathhouse & Waterslide facilities as Hwy 59. Those people coming from Windom would have come in on Hwy 60 or the old Windom road prior to the establishment of Hwy 60. It is not clear to me how this traffic flowed to the south. Those coming from the west on US Hwy 16, came down Humiston to turn east on 10th Street, then south on 2nd Avenue to the lakeshore where they went under the RR viaduct.In each case, people going places, farm families coming to town, and travelers would see this Bathhouse & Waterslide facility. This had a natural promotional effect for the bathhouse Association, and Worthington in general..
4. The Mpls-Sioux City railroad had an positive impact on this facility being there. a. Lake Okabena is the only lake along the railroad between Mankato, MN and Sioux City IA. 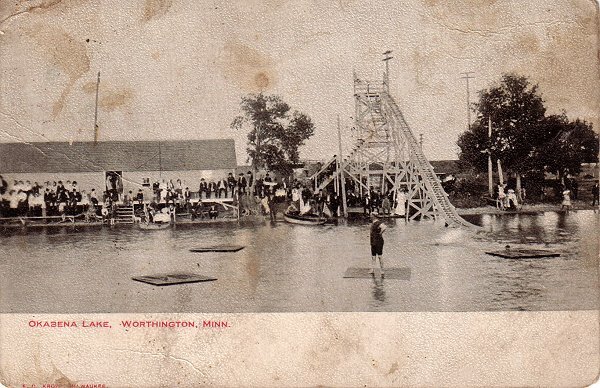 The Mpls - Sioux City railroad promoted package recreation trips to the Worthington Lake Okabena Bathhouse & Waterslide facility to families along their routes. b. You could board an excursion train in Sioux City at 8AM on Sunday morning and be sailing, boating, swimming, water sliding, picnicking, etc by 10 to 10:30 AM and stay there until 4PM at which time they would pick you up and take you back home. The railroad had a special stop along the beach for such purposes so as to avoid the long walk from the regular train depot at 11th & 2nd Ave.
c. It has been speculated that the railroad gave money to the Bath House Association to help develop the facility. Who Managed & Owned the Bathhouse & Waterslide Facilities? These facilities were owned and managed by Charlie Alvord in the pre 1900 years. It isn't clear to what degree he may have sublet the facilities to the Worthington Bathhouse Association which formed in 1905, These facilities were not owned nor managed by the city government according to AP Rose's account in his "History of Nobles County" P 197. He described their membership in 1908 as being about 90 people.There was a fee to belong to this Association. 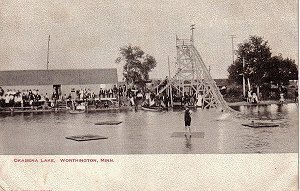 One of the early postcards includes a number of people who probably are the members of the Worthington Bath House Association at that time. They are posing there in street clothes ( some even wearing hats ), not wearing swimming apparel as would be the case if this were a photo of swimmers using the facilities. This group posing in street clothes suggests this is a membership photo. "A social dance was given at the bath house pavilion last Wednesday night by the young folks of the village. It was an informal affair and was fairly well attended. Messrs. Mackay and May furnished excellent music for the occasion." "The boats were all removed from the pavilion Monday, as the boating season is about over. The bath house, however, will be open after four o'clock each afternoon and on Saturdays as long as the weather will permit." The bath house was opened for the season last Monday, with Geo. Kunzman as superintendent. The new pavilion above the bath house is completed and furnishes accommodations for a large number of spectators. A special meeting of the Bath House Association will be held at the Firemen's hall this evening at eight o'clock for the purpose of disposing of the new private bath rooms. Other business is also to come up for consideration. Nels N. Nelson will run the stand in the bath house pavilion during the present season. Mr. Lloyd Clabough, of Jackson will be in charge. Mr. Nelson will give a series of dances in the pavilion each night during Chautauqua, and if the young folks desire it a number of dances will be given during the season. Mr. and Mrs. F.L. Keith, Will Wilbert and Miss Lena Kleveter, of Reading, drove down Wednesday evening to enjoy a plunge in the lake and to shoot the chutes. Messrs. Randall Hough, B.S. Garberson, Pat Carey, Raymond Bahne, and Doctors G.E. Dickson and E. Dietrish, came up from Sibley Friday afternoon and partook of bathing at Lake Okabena and shooting the chutes until the next train, when they returned home. They stated that it was their intention to come up every other day for a plunge in the lake. L.A. Gregory's orchestra, consisting of three pieces with the leader as violinist, Carl Cowin, clarinet, and Miss Robinette Scheier, pianist, came over from Adrian Wednesday to play for the dance at the bath house pavilion that evening. Wednesday evening the members of the Bath House association met at the Firemen's hall and elected the following committee for the ensuing year: W.B. Stoutemeyer, Lee M. Shell, Dr. Ray Humiston, Dr. E.C. Dieckhoff and W.M. Evans. A balance of $122.72 is in the treasury and all outstanding debts paid. There are at present about seventy members in good standing in the association. Chas. 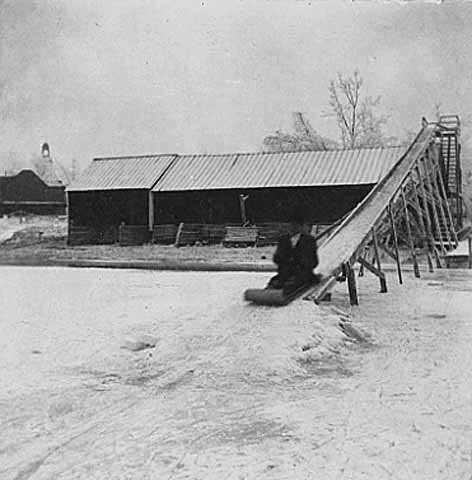 Chermack was injured severely, while assisting in the ice industry at the lake. He was on the chute, endeavoring to shove a cake of ice along, when another cake came gliding along the chute and caught his knee between the two chunks. As a result he was laid up for a few days but is again able to be about.